A reader recently asked about a post on WUWT which, to everyone’s shocking surprise, claims to contradict man-made global warming. It claims that temperature records (at individual stations) follow step changes rather than linear increase, so the theory of anthropogenic global warming (AGW) is wrong. Let’s apply the same regime shift detection tool (from Radionov) used by the blog post’s author. It indicates 6 regime shifts over the 100-year period. Each of the regime shifts is strongly statistically significant, there’s absolutely no doubt about it. This illustrates one of the most important lessons in statistics: just because your model is overwhelmingly statistically significant, that doesn’t mean your model is correct. It only shows that the null hypothesis is wrong. The null hypothesis is “no trend at all.” The regime-shift detection tool has succesfully disproved that. Congratulations. But is has not shown that the data follow a series of step changes. The fact of the matter is that the regime shift detection tool will respond to just about any trend, no matter what its form. Even if the trend is perfectly linear. The other fact of the matter is that for these data, the trend is perfectly linear. This is artificial data, and that’s how I designed it — a linear trend plus random noise. Ironically, the shift-change model actually has smaller residuals. But it also has more parameters (quite a few more in fact), and according the the Akaike information criterion (AIC) the linear model is better. But the difference in AIC is small and says the linear model is only slightly better! It’s even possible (not very likely, but easily possible) for the opposite result to have occured. The step-change model is nothing more nor less than regressing onto step functions — which make excellent (and very generally applicable) model functions in general. The fact that they fit this (or any other) data well is neither a surprise nor a big deal. The data in the GHCN version 3 are nearly identical. All the shifts are strongly statistically significant. No doubt about it. Once again, both models mimic the data well. Both are strongly statistically significant. Both disprove the null hypothesis that there’s no trend. The step-changes model has smaller residuals, but the two-straight-lines model has lower AIC (better model). It’s bad enough to make a claim without demonstrating its correctness — one that apparently hasn’t even been properly tested. It’s worse to attach false significance to it, that the claim somehow contradicts anthropogenic global warming, which wouldn’t follow even if it were demonstrated. It’s pretty clear — in fact it’s bloody obvious — the author simply applied an analysis method, misinterpreted the result, then concluded what he wanted to conclude for no other reason than that’s what he wanted. That’s what passes for science at the WUWT blog. I am very impressed by the precise fit that this step change method achieves. A remarkable 58% of the steps fall within 3 narrow time frames. Of course, the other 42% would be a big problem for a statistician or climatologist. But when you practise numerology you can simply ignore them whiout even a by-your-leave. Now that is what I call an impressive technique! The WUWT bloggers conclusion is very naive and shows the effects of a lack of experience and peer review. I have a career of experience working with ecological data that is often both complex and noisy. One hopes for enough data to show clear positive or negative trends, but the idea that field data can differeniate between similar models is often hopeless. Even lab experiments done under well-controlled conditions often don’t distinquish between similar models. “compute models” should read “computer models.” Aside from that, this is another hit out of the ballpark. Well done. This ‘step’ change has a certain currency, it seems; I’ve encountered the same claim about the UAH global record. And, as in the blog post debunked in the present article, the (alleged) ‘step’ was associated with the ’98 El Nino–though just how a redistribution of heat within the ocean/atmosphere system is supposed to increase the temperature permanently was left tactfully unasked. It seems that the laws of thermodynamics only apply to backradiation–not ENSO. I wish that it had been around when some of us were engaging Anthony Cox (aka ‘cohenite’) on a Deltoid thread, about a little scribble he knocked up with David Stockwell. The dear boy was all sweaty about the results of a Chow test; I rather suspect that this piece of Tamino’s would have somewhat hosed down Cox’s ardour. WUWT – where every day is 1 April. which incudes a link to their paper – be sure to check the amusing graph on page 10. I have no problem envisaging that temperature could rise in a stepwise fashion over time – although this post shows that the straight line is a better model. I fail to see how a stepwise rise would negate the fact that the world is warming – or that it’s caused by human activities. Up is up, whether you take the stairs or the lift (elevator). Please allow me put a naïve question forward: How does Lorenz’s idea of chaos theory in which a system exhibits multiple stable states and ‘snaps’ from one stable state to another relate to global temperature? Would it be possible to detect such stable states in global temperature or only in certain parts of the climate system (a prominent example could be the ice-sheet behaviour, i.e. tipping point, in a warming world)? In other words, can Lorenz’s idea supply a physical basis for observing step changes in global temperature? This idea is most easily understood in terms of a phase space. For there to be quasi-stable states (sometimes called strange attractors), the system must have points in phase space that are much more stable against small perturbations than the majority of the phase space. When the system is perturbed beyond the stable range of the attractor, it will oscillate wildly until it reaches the vicinity of another attractor and then may settle into an oscillating pattern again. I don’t think that climate exhibits such behavior in any obv ious way–except maybe the glacial/interglacial oscillations. Cynicus, be careful, oscillations about an attractor are not periodic as in a sine wave. They may be quasi-periodic–in that it may take a certain amount of time to have a large enough fluctuation to move away from the attractor to another, but this is different. The process is random–though not stochastic, in that it need not pass through every point in phase space. Rattus, I’m afraid I don’t find WTFUWT sufficiently edifying to offset the distaste of increasing traffic to the blog by even a single hit. Oh, definitely look into it. Chaos is pretty cool stuff, and I think a layman with a decent math background can mostly understand it. Have fun! This subject comes up a lot on Climate Etc., and with the usual implications that climate scientists are dumb and way behind the math and don’t understand it. Ray – very succinct explanation. 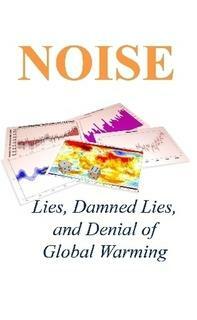 Maybe you could get the climate scientists up to speed! ‘The null hypothesis is “no trend at all.”’ – priceless! Thanks, thanks, thanks! Excellent post, Tamino! 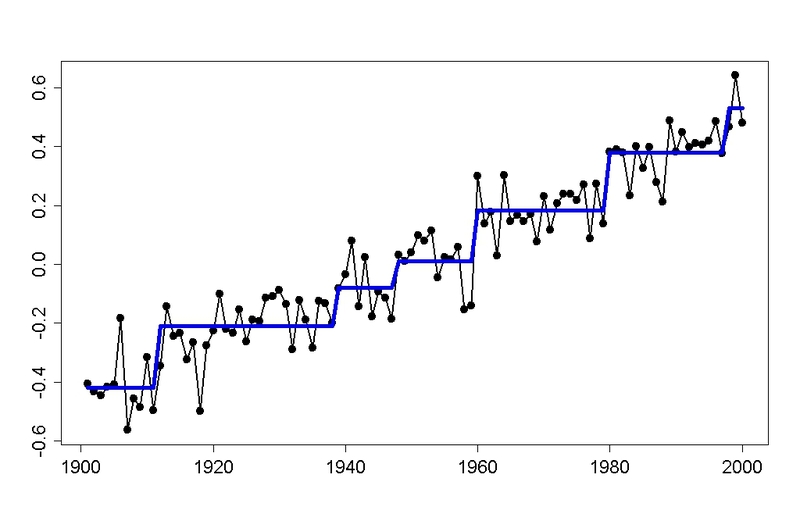 The Belgian Meteorological Institute has long (I don’t know if they are still doing it) said that the temperature record in Belgium was not rising, but just some step function (with one step, until 2007, with two steps thereafter). Your post definitely proves that whatever data you take, you’ll probably find a step pattern if you want one. I did not know that it was that easy to create a step pattern if you wanted too. My mistake of course for never testing it. So thank you for enlightning me! I’ve always considered ‘step function’ claims to be just another example of over-fitting the data. Add enough parameters, you can fit _anything_ – but as per the AIC that fit may not be a reasonable one, just not justified by the information in the data. “It’s a step, not a linear trend!” Stone, R.J., 2011: Comments on “Observed Trends in Indices of Daily Temperature Extremes in South America”. J. Climate, 24, 2880-2883. DOI:10.1175/2011JCLI3662.1. “But your step detector assumes zero trend!” Vincent, L.A., X. Zhang and X.L. Wang. 2011. Reply to Comments on “Observed Trends in Indices of Daily Temperature Extremes in South America 1960-2000”. J. 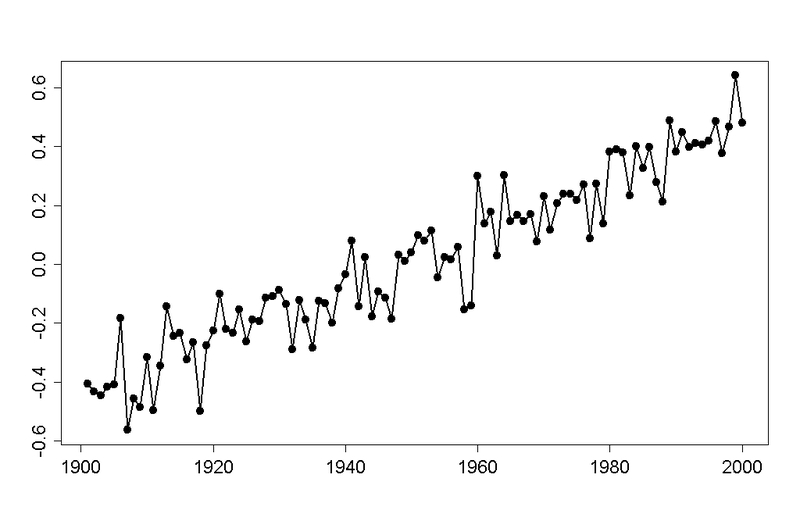 Climate, 24, 2884-2887, doi:10.1175/2011JCLI3786.1. There is this as well, a rebuttal to the reply. The ‘step change’ myth seems to be gaining popularity amongst the fake skeptics. We’ve covered it at Skeptical Science as well. The glaring flaws in the argument are numerous, but the lack of a physical explanation is what bugs me the most. The fake skeptics tend to claim the step changes are caused by oceanic cycles like ENSO. Okay, so if El Nino causes a step change upwards, why doesn’t La Nina cause a step change downwards. Or, if oceanic cycles are causing step changes of surface warming, why aren’t they also causing step changes of ocean cooling? Of course, when a fake skeptic arrives at his pre-destined conclusion, he tends not to ask questions like these. As you say, this is what passes for science at WUWT – anything which seems at the surface to undermine the AGW theory in any way. I’d thoroughly recommend that people follow Dana81’s link, and especially to look at the flicker graphic of an artifically-constructed non-step warming trajectory that looks step-like. It complements Tamino’s work nicely. Someone should collect all the different weirdo fits received approvingly at WUWT, and make a summary. There’s wavy fits, step fits, fits to such high order polynomials that they extrapolate to a precipitous drop after the current year, … Anyway, they all contradict each other, so might be fun. Or that the warming ain’t alarming. Nice. Its always good to have someone who will take apart the dodgy statistics of WUWT types. 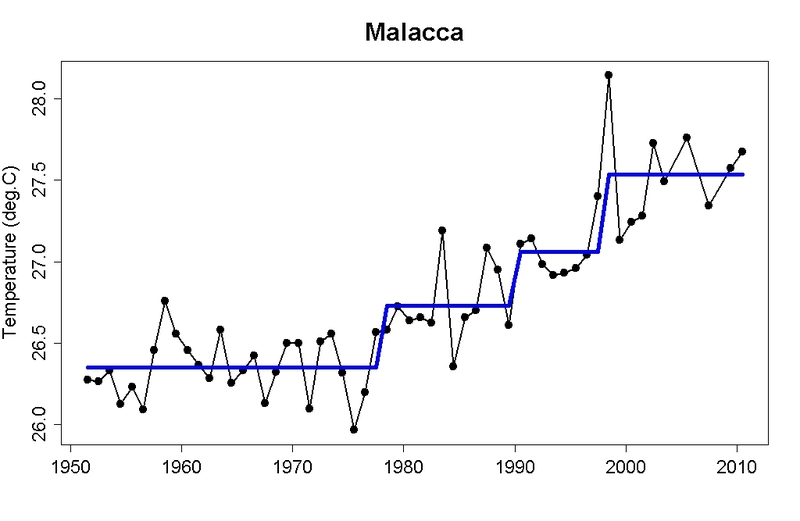 Is it possible to post a link to the R – code that did the fits shown in the Malacca graph? I downloaded the excel step fit stuff (in Excel) but this doesn’t do the bi-linear fit shown in the graph. The bi-linear fits are useful because they are consistent with the idea of the existence of low dose thresholds for effects (responses) in dose / response modelling. Your steps 2 post is also very interesting because it addresses the model comparison questions. 2. There is no known or even imaginable physical cause (input function) that would result in such a step-wise temperature behavior (output function). 3. A step-wise function is easily explained by the human proficiency at seeing patterns even where there are none: in clouds, in the arrangement of stars, lions in the rustling grass, and Jesus in a piece of buttered toast. A very good post, but Granger causality runs from T to AMO and not the other way around. I don’t think JMP checks for Granger causality. What statistical package does that? Use a partial-F test (Sims 1972). Regress Y on Y(t-1), then on Y(t-1) and X(t-1). If there is a significant decrease in the sum of squared errors, X Granger-causes Y. You may wish to use multiple time periods back to check if there is a different effect. wait, does this mean if I ride an escalator, I can get upstairs, but if I try using the stairwell, I can’t? The meaning of the word “upstairs” suffers here. I think the idea is that if you take the stairs, the means of your having gotten upstairs is unknown, but is most likely due to natural variation of the distance between your body and the center of the earth.